Balloon Adventures is, I think, the quintessential birthday stamp set! 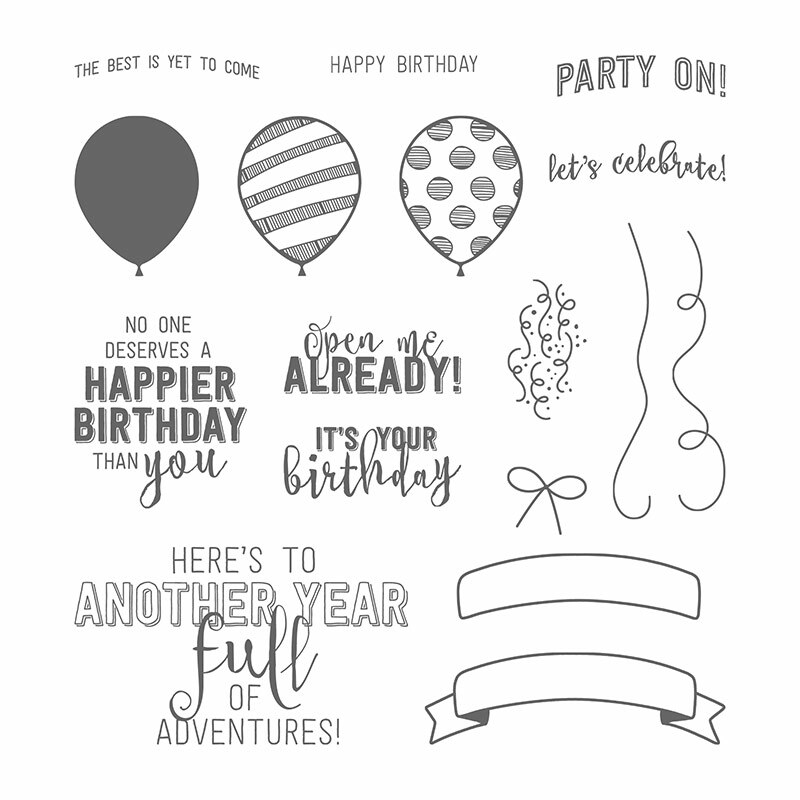 It has everything you need for a great celebration – images of balloons, confetti, balloon strings that are curly & swirly; and some of the best birthday sentiments I’ve seen in a long time. Yes, this set truly makes me happy 🙂 I’m sure that’s why I chose to use it to make my youngest son’s birthday card. See – I wasn’t exaggerating! 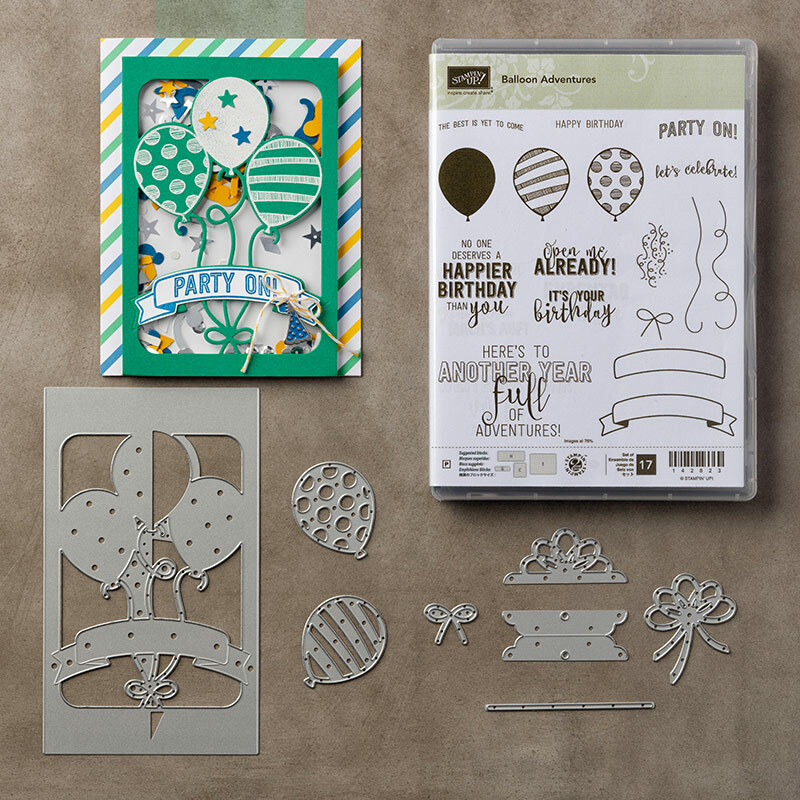 And to really want to make a ‘wow’ card with this set, Bundle it up with the Balloon Pop-Up Thinlits, and save yourself 10%! 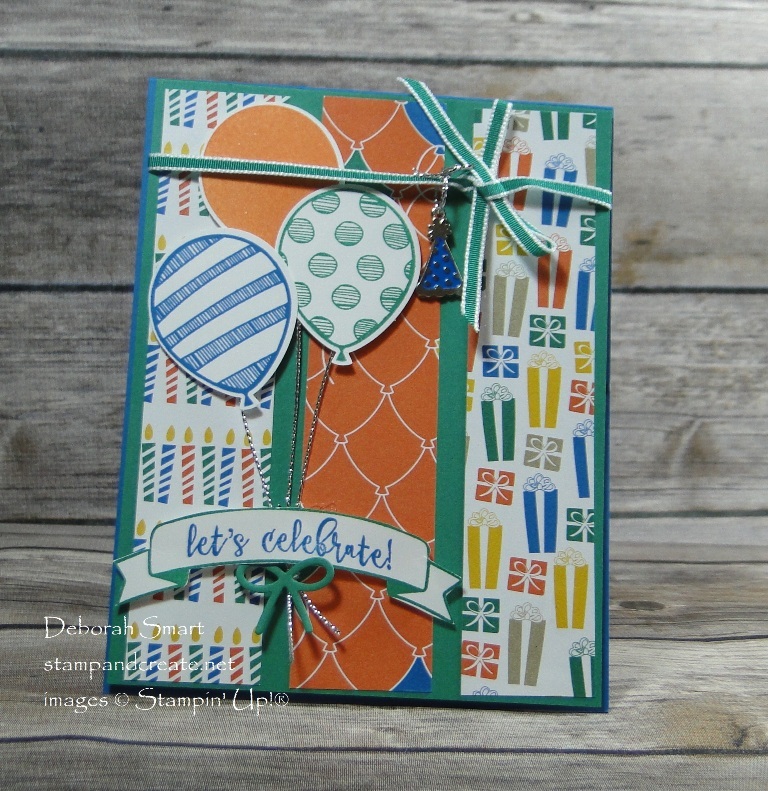 As I had used the Balloon Pop Up Thinlits in January for our eldest son, I chose to not use them again on this card. Instead, I used the Balloon Bouquet Punch for my balloons. The Party Animal Suite of products really help to kick off the party! I pulled my colour palette from the Party Animal Designer Series Paper Stack. 3 panels, each with different patterns,were cut & layered onto a panel of Emerald Envy cardstock. I wound a length of Emerald Envy 1/8″ Taffeta Ribbon around the top of the panel, and tied it off into a bow. A little party hat – a cute painted silver embellishment from the Party Animal Embellishments, was tied onto the ribbon. The front panel is attached to the Pacific Point cardstock base using Stampin’ Dimensionals. 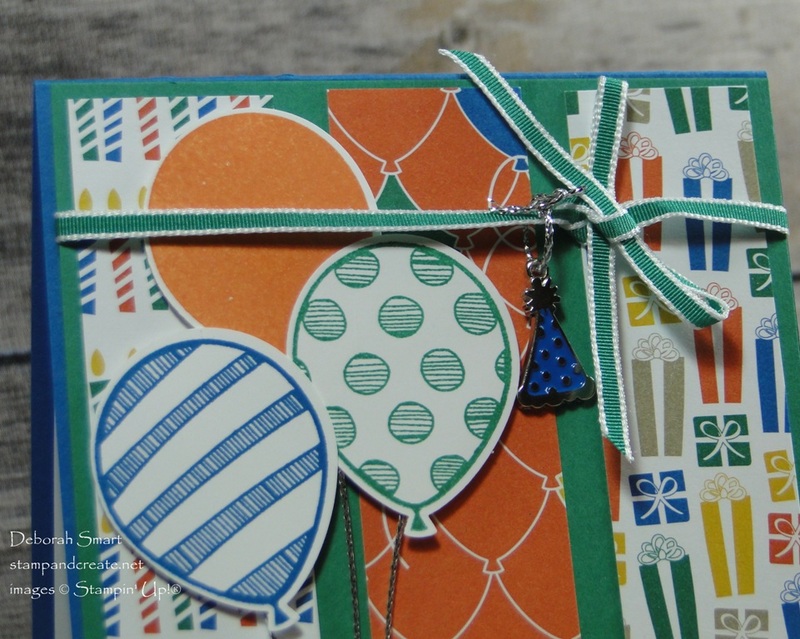 Each balloon is stamped onto Whisper White cardstock; one each in Pacific Point, Emerald Envy and Tangerine Tango. The Balloon Bouquet Punch made quick work of punching them out! I added a string of retired Silver Cording Trim added to the back, and each was attached to the panel using Stampin’ Dimensionals. Using Emerald Envy ink,the banner outline is stamped onto Whisper White cardstock, the sentiment then added in Pacific Point ink. The balloon strings are held down behind the banner with a Stampin’ Dimensional. The whole thing is finished off with a cute little die cut bow in Emerald Envy cardstock. Even a small detail like this bow is easy to achieve with the Balloon Pop-Up Thinlits! So, that’s the long story behind this card! The short story is – he liked it! 🙂 I’m not sure whether he saw me making it or not; after all, my crafting area is my dining table. But, he did say that he liked it, and enjoyed celebrating his birthday all weekend long. Leave me a comment, and let me know if you liked it! 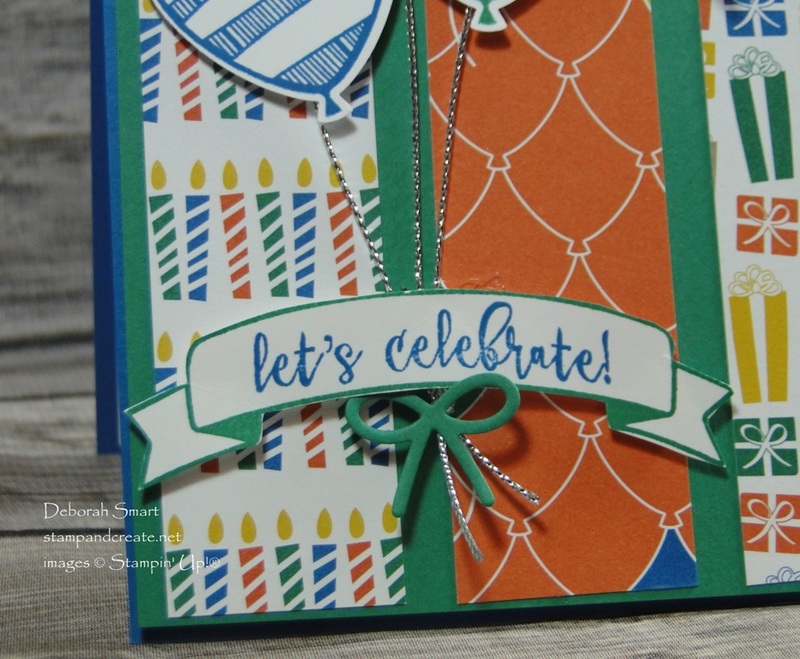 You can order the products used to make this card by clicking on the product images below.